We’re excited to be attending the Miami International Boat Show February 16-20, 2017. The show is being held at a new island home at Miami Marine Stadium Park & Basin. Tickets can be purchased from the Miami Boat Show website. Miami International Boat Show & Strictly Sail is a 5-day event and will include on-the-water boating workshops, daily seminars, and some great ways to test out the waters including paddle sports demos. There will be a variety of dining options on site and both closed and open-air tented exhibit space for marine products and accessories, coatings, electronics, engines, nautical gifts and apparel and services with more than 1,300 boats on land and in the water. 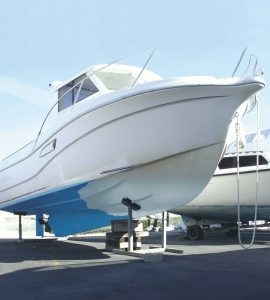 We’re excited to get a look at the best that the marine industry in the USA has to offer. We’d love to chat to you about our marine range including Deks Olje D1, our high quality hardwood saturating wood oil with a matte finish and our high gloss oil Deks Olje D2 for handrails, paneling and other decorative finishes. We can tell you more about our quick drying polyester fillers, our anti-corrosive coatings, our cleaners and strippers and our decorative finishes. You tell us your problem and we can give you an Owatrol solution.